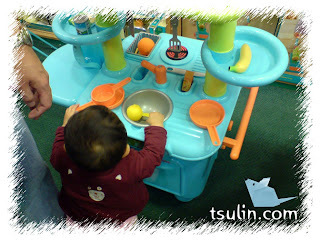 tsulin + +: The Little "Souz Chef"
The past 2 months, I noticed Shean Wenn has been having a little "separation anxiety". Our apartment is quite small and when i put her in her playpen, she will be able to see me even if i moved into the kitchen. i really do not see a reason why she would want to scream for me, or if she isn't "impris*ned", she would drop everything that she is doing and crawl into the kitchen to look for me. This might explain why... Perhaps my Shean Wenn has been busy learning essential "living skills" while being with mummy in the kitchen. SW was actually using a ladle/spoon to "stir-fry" a lemon in a "wok" - which is actually a sink! 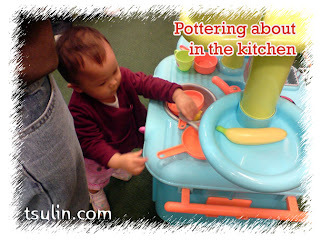 She, mimicking the ways of pottering around the kitchen : At one point, she even kneeled down to open the "cabinet" underneath the sink to take out some dishes from the "dishwasher". 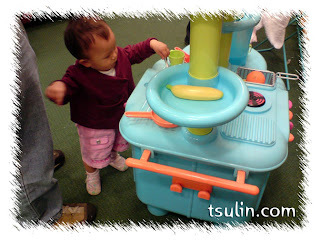 And when it was time to go back, hubs had to literally tear her away from the kitchen set! She gave out a loud scream and kicked her legs in protest. By golly, I didn't know she would be SO ENTHUSIASTIC about it! The set costs £60, but they are currently running a promotion in-store that when you buy the kitchen set, you get a free accessory set worth £30 (plus, I have a £5 off voucher to spend instore for June). Personally, I would have preferred her to enjoy playing with garage sets or those boys' tools kit. But well... if she likes this, she likes this. 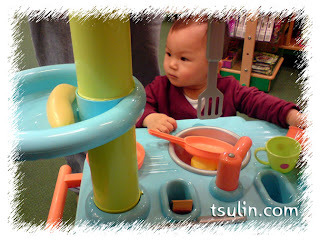 She looks so "comfortable" with the toy kitchen, as if she's been using it for a long time already. SW Kicking and screaming?! I can't imagine that. She must have been so in love with it. Must get, must get! Chip-Pea : Well, kicking and screaming in a mild way. But still, I didn't expect that she got attached to it so fast! HaHA... 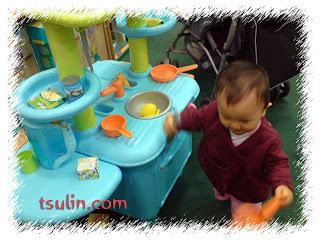 Chef in the making.. Bravo ! 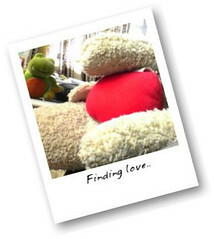 SW. By the way, SW can stand quit firm n steady. How she manage that? KC : Yes she can stand quite well. I guess I just let her loose all the time, giving her opportunity to fall donw and climb back up. I see that your YS is also standing well, isn't he? She can now also walk a few steps (albeit slowly). And if you hold her hands, she can walk with you. Very exciting!